Facebook has proven to be immensely popular on smart phones: it’s the most downloaded application of all time on the iPhone and probably holds the record on Android as well. But the user experience for so-called feature phones, which still make up the vast majority of cell phone usage worldwide, hasn’t been as rich — users generally have relied on Facebook’s lightweight m.facebook.com site, which gets the job done, but doesn’t really have an ‘app’ feel. Today, that’s changing. Facebook has just announced the launch of a new application for feature phones that was developed in conjunction with Snaptu. According to Facebook’s announcement, the app will work across 2,500 device models from the likes of Nokia, Sony Ericsson, and LG. The application will include a home screen that looks similar to the one seen on the iPhone and Android, and Facebook notes that it also includes contact sync support and faster scrolling through status updates and photos. 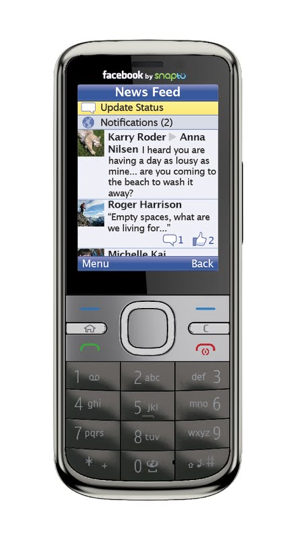 If you’re on a supported feature phone, you can download the application right here. To help introduce the new app to users (and get them hooked), Facebook has partnered with 14 mobile carriers worldwide to offer free data access to the application for 90 days. This is probably going to lead to a significant jump in mobile usage for these feature phone users, especially if carriers help Facebook get the word out. Facebook has another mobile initiative called Facebook Zero that delivers a super-lightweight version of the site to users on certain international carriers, free of charge. Update: I just spoke with Snaptu CEO Ran Makavy and Henri Moissinac, Director of Facebook Mobile, who shared some additional details. The relationship between Snaptu and Facebook isn’t being discussed (i.e. they aren’t saying how much money is changing hands as part of their partnership, though they did say no ads are being shown in the app). They say that the relationship will be long-term as Snaptu continues to help improve the app. You can only use the application if you are on one of the supported carriers — even if you’re willing to pay your own data fees, the app simply won’t work if you’re on an unsupported carrier. It sounds like Facebook offered these carrier partners exclusivity to help sweeten the deal, but things may change down the line. Makavy points out that even if you can’t get the official Facebook app yet, you can still download Snaptu (and download their Facebook application from their), which is very similar. The 90-day free window begins today, not when the user first gets the app. Facebook found that the big hurdles facing feature-phone users were price and a lack of some functionality on m.facebook.com. Facebook Zero is meant to help with the first problem, this application helps with the latter (and Moissinac says that it should also use less data that m.facebook.com, which should make it cheaper as well).